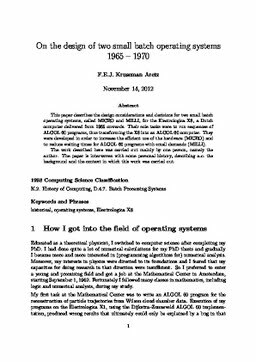 This paper describes the design considerations and decisions for two small batch operating systems, called MICRO and MILLI, for the Electrologica X8, a Dutch computer delivered from 1965 onwards. Their sole tasks were to run sequences of ALGOL 60 programs, thus transforming the X8 into an ALGOL 60 computer. They were developed in order to increase the efficient use of the hardware (MICRO) and to reduce waiting times for ALGOL 60 programs with small demands (MILLI). The work described here was carried out mainly by one person, namely the author. The paper is interwoven with some personal history, describing a.o. the background and the context in which this work was carried out. Kruseman Aretz, F.E.J. (2013). On the design of two small batch operating systems 1965 - 1970. Software analysis and transformation [SwAT]. CWI.